Ice Cream in Baghdad ! 5 Priests in Vatican , You Too Go Home! To the question `how does Al Jaiha compare to when Saddam was in power` they are quick to respond. `When Saddam was in power we would be watching one of the three Saddam TV Channels with him on TV or some old, boring black and white movie. Nobody would be talking freely and we would quietly eat and leave`, says Remon. Prices are booming and the value of the Iraqi dinar is rising. A house that would go for $30,000 months ago is nearing $100,000. The Iraqi dinar which before the war fluctuated in the 2500 to 3,000 to the dollar range is now nearing 1200. For the average Iraqi it is the best of times. Something they never even dreamed of. It is the planned July 1 handover of power in Iraq . While the original plan, as in Japan and Germany , was to have a constitution, elections and a government in place, due, the Iraqis say to fears of the impact of Iraq on the upcoming US Presidential election the schedule was suddenly changed. Sunni Muslim, Ahmed Tarik, 23, joins in `We just want to be left alone. Saddam was terrible, but becoming like Iran would be worse.`. [Z-info: A proposed French law prohibiting the wearing of religious symbols in public schools banned Islamic headscarves, Jewish yarmulkes and large Christian crosses. Those were the three items singled out last month in a speech by President Jacques Chirac and in a report by a blue-ribbon commission on religion and the state. In its current draft form, the law states that in public schools, "Signs and dress that ostensibly show the religious affiliation of students are forbidden." Recently, Luc Ferry, the Minister of National Education, went even further. He told the National Assembly's legal affairs committee that any girl's bandanna that is considered a religious sign (as opposed to a fashion statement, presumably) will also be banned. Mr. Ferry is a philosopher and political scientist by education. First came out publicly against proposals from the parliament to pass a law banning religious symbols in schools. Now he is calling the Muslim veil "a militant sign that calls for militant counter-signs." Pope John Paul II told Vatican diplomats last week that religious freedom in Europe was endangered by people seeking to ban religion from the public sphere. He did not specifically mention France . Luc Ferry, the French minister for national education has disappointed Assyro-Chaldeans of France , by indicating they may be a danger to secularity in the schools. For several months, the debate on secularity in schools has impassioned the French people and the media. The wearing of religious signs at school occupies the scene and risk to keep its dominant place until the vote of the law which would prohibit the Islamic veil, the kippas and other signs too visible. France is, with Turkey , one of the two secular countries of the world. With the difference of Turkey where the religion is under the control of the State, France had separated the religious area and the State in 1905. Then, why did it have problem with secularity and why France felt the need to legislate on this level? We will try to describe briefly what occurred in France and explain, then, how Assyro-Chaldeans were mingled with this history with law which did not relate to them? A few months ago, having a presentiment that secularity is in danger, the president of the French Republic, Mr. Jacques Chirac, asked Bernard Stasi to gather a commission which would prepare a report allowing him to know which political measurements were essential to guarantee separation of the State and the religion at the school and in the public institutions. The Stasi Commission, composed of French or Foreigner intellectuals and specialists, met for two months, heard many testimonys and finally prepared a report submitted to Jacques Chirac. The report advised in Jacques Chirac to transform the Moslem and Jew feastdays into official non-working days. Indeed, nearly 600 000 Jew and five million Moslems live in France . This proposal was not adopted. The president of the republic then asked the government (to the right) of Jean-Pierre Raffarin to make vote a law prohibiting the wearing of open religious signs at the school (veil, kippa, large cross). The debate began. Why this law? This law was initially related to the Islamic veil. Two Turkish girls, inhabitant of Flers, had refused in 1999, to remove their veil before attending the classes. In addition, they did not want to take part in sports or biology classes, which they regarded as contrary to their female condition and to Islam. They were expelled from school. The business of the scarf returned, a few months ago, when two girls, suddenly decided to wear the veil in their school. Jacques Chirac wanted to prohibit the veil at school. His request for the ruling to prohibit the religious signs at the school revolted the Moslems and particularly the Islamic organizations which organized demonstrations against this rule. Thousands of women, behind whom the Islamists hid, protested in the streets of Paris against this new law. An anti-semitic founder of the Moslems of France' Organization, Mohammed Latrèche, did not hesitate to threaten Jacques Chirac and in his person, the laic republic. The government, weakened by these demonstrations and these threats, wanted to justify its law differently, to find another solution and especially a bait. The bait was the Assyro-Chaldean community! Indeed, A few days after the manifestations of the Moslem women, Luc Ferry, Minister for national education, declared at the Parliament that this law did not relate only to the Islamic veil but also to the kippa, the turban of Sikhs and the "large crosses out of wooden carried by Syro-Chaldeans". Luc Ferry said that around fifty of case had been noted in the Paris area. What was completely false! The Assyro-Chaldean community of France highly reacted to this misinformation. Luc Ferry was victim of itself. The Assyro-Chaldeans' Association of France immediately distributed a press release saying that the community (16 000 people) is completely integrated into the French Republic . It refuses to be used as a "exotic folding screen" in the vote of a law which does not relate to it. The media lengthily echoed this information. Tens of articles and audio-visual reports were diffused. Nobody believed Luc Ferry. Indeed, the young Assyro-Chaldean people of France do not carry large crosses. Assyro-Chaldeans defend the principles of secularity and regard France as their new Mesopotamia . Luc Ferry tried to show us like a christian sect. The French, who regarded us as people missing for a long time, now had an false image of us. Assyro-Chaldeans (Luc Ferry had mispronounced our national name in Syro-Chaldean), are respectful to this country which had welcomed them and now they was nothing any more but one danger for secularity as well as for the republic. French chains of television like Canal + and newspapers such Le Parisien, La Croix, Le Monde, Libération, The Daily Telegraph and Hürriyet published many articles concerning this affront against Assyro-Chaldeans of which 80% are naturalized French. Many politicians, organizations and intellectuals gave their support for the community specifying that Luc Ferry had made a fault. Joseph Yacoub, Assyro-Chaldean intellectual, specialist in minorities, teaching at the Catholic University of Lyon (France), author of many works on Assyro-Chaldeans and the minorities addressed a mail to Luc Ferry, saying him that the community is very well integrated in France and that it maintains a major friendly relation with the French State. Questioned by the Assyro-Chaldean Voice concerning his position concerning the law project, Joseph Yacoub was reserved on the need for such a law. France is a laic country and separation was done between the religion and the State in 1905. Concerning the remarks of Luc Ferry in connection with Assyro-Chaldeans, Joseph Yacoub was astonished and surprised by such remarks which he did not expect. The government, he said, creates problems where there is not. The remarks of Luc Ferry are unjustified according to the Assyro-Chaldean academic. The minister was surely very badly informed on our community. Which attitude against Luc Ferry ? Joseph Yacoub recommends his information on the Assyro-Chaldean case: "it is necessary to point out the historical bond which binds Assyro-Chaldeans and France ", he said to the Assyro-Chaldean Voice. Professor Yacoub estimated the reactions of AACF as very positive. The official statement diffused by our Association did nothing but "restore the truth" concerning our people in France . Nevertheless, Joseph Yacoub considered that this "misunderstanding" gave the opportunity to us to inform the public opinion. Assyro-Chaldeans love France and will respect all the laws. 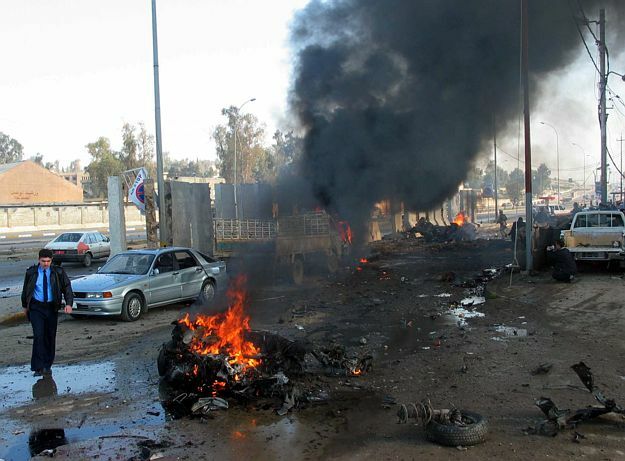 (ZNDA: Mosul ) A car bomb exploded Saturday, around 10 in the morning, outside a police station in Mosul , killing at least nine people and wounding 45. Witnesses saw severed limbs and decapitated bodies on the street in front of the police station. Windows of buildings were shattered and plumes of smoke could be seen in the area. The police station is next to the University of Mosul campus. Mosul is about 225 miles northwest of Baghdad . The Assyrian Patriotic Party office in Mosul is located nearby the police station. According to reports received at Zinda Magazine the explosion caused serious damage to this office building and the cars parked in the front. Two APP members, Mr. Odisho (no last name given) and Mr. Adnan (no last name given) were taken to the Republican Hospital for treatment. (ZNDA: Arbil) This week the two main Kurdish political parties blamed the Islamic militant group, Ansar al-Islam - an al-Qaida-linked militant group- for suicide bombings that killed at least 101 people in Arbil on Sunday. Thousands gathered to mourn at the ancient Assyrian city of Arbil 's largest mosque in a show of unity. The attacks Sunday devastated the Kurdish parties' offices. Over 250 other people were wounded in the two blasts. The Patriotic Union of Kurdistan said a video camera captured images of the man who blew himself up inside its office, slipping in alongside hundreds of well-wishers greeting PUK officials on the first day of the Muslim holiday Eid al-Adha. Only the back of the bomber's head was visible in the footage. The man, apparently in his 20s or 30s, shook hands with one of the Arbil office's deputy chiefs, then stepped forward and put his hand in that of another. Almost at the same time, the second bomber struck a similar ceremony at the office of the Kurdistan Democratic Party. Ansar al-Islam, or "Helpers of Islam," is a group of several hundred Kurdish militants who have vowed to establish an independent Islamic state in the north. It was formed in 2000 and began stepping up its activities in October 2001. At presstime it is not known if any Assyrian officials were among the victims of these bombings. The killing of the KDP and PUK officials also coincided with the third anniversary of the assassination of the former Assyrian governor of Arbil, Mr Francois (Franso) Hariri. Mr. Hariri was shot dead by unknown gunmen in his car while driving in the city of Arbil , the capital of the province. The Arbil province, prior to the occupation of the U.S. forces, was controlled by Massoud Barzani's KDP. Mr. Hariri was an active and trusted high-ranking member of KDP's Political Bureau and in charge of Branch Two of the Party. This position was held by Mr. Saad Abdulla until his death in the suicide bombing on Sunday. The KDP officials blamed Islamic militant in North Iraq for the assassination of Mr. Franso Hariri in Arbil. (ZNDA: Telkefe) The Central Bureau of Information & Culture of the Assyrian Democratic Party in Iraq has reported a failed assassination attempt on 24 January on the Mayor of Telkefe (Tel Kaif), Mr. Wadhah Giwargis Elias. The Mayor was returning to Telkefe after ending a meeting with the Governor of Nineveh Province, when unidentified criminals concealed among a group of citizens near the College of Dentistry in Mosul began shooting at his automobile. The car was damaged, however, neither the Mayor nor his security personnel were injured in the assassination attempt. (ZNDA: Baghdad ) On 22 January the newly-elected Patriarch of the Chaldean Catholic Church, Mar Emmanuel III Deli, offered a letter of appreciation to the officials of the Iraqi Governing Council in Baghdad . In the letter His Beatitude writes: “I thank you and wish you success for the work done for our people and our Iraqi brothers.” Mar Emmanuel continues to say that with the effort of these officials Iraq can once again establish itself in the world community. In his letter, His Beatitude desires greater unity among Iraqis and asks the officials to promote stability, security, and prosperity for the people of Iraq . Mar Emmanuel then continues to write: “I promise you…that we are ready to cooperate in order to establish a better Iraq , that will be an example in the areas of religious, political, cultural and social freedom for all her sons without exception”. 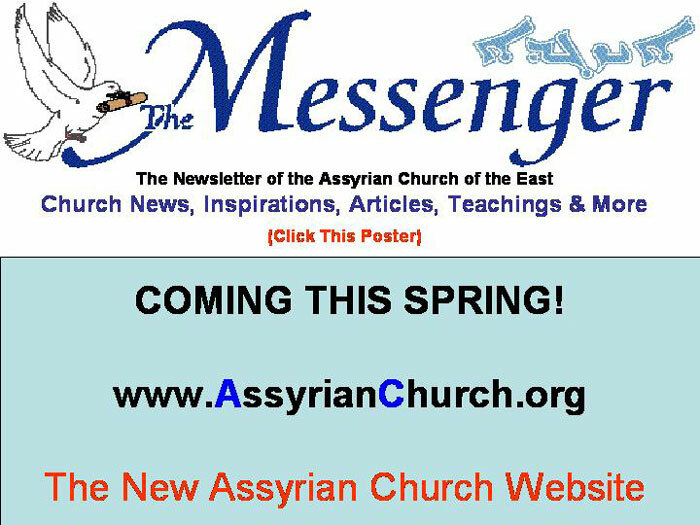 Mar Emmanuel qualifies “We” by continuing to say: “We, the Chaldoassyrian Christians, owners of the Syriac culture and language for many millennia, have worked together with our Muslim, Yezidi and Sabbean brothers with our hearts and soul.” Mar Emmanuel is the first head of a Syriac-speaking church to personally endorse the title of “Chaldo-Assyrian” in Iraq in an official capacity. (ZNDA: Damascus ) On 29 January a delegation from the Iraqi Governing Council met with the Syrian president, Dr. Bashaar al-Assad, in Damascus to review the current situation in Iraq and future diplomatic ties between the two countries. The Honorables Yonadam Kanna and Mouwafak al-Rabii also met with the Syrian Vice President, Mr. Abd al-Halim Khaddam and Mr. Mahmood al-Sayed, Syrian Minister of Culture. On the same day, Mr. Kanna also met with His Holiness Moran Mar Ignatius Zakka I Iwas, Patriarch of the Syrian Orthodox Church. The Honorable Yonadam Kanna meeting with Holiness Moran Mar Ignatius Zakka I Iwas in Damascus . On 30 January, the IGC delegation visited Lebanon and met with the Lebanese Parliament Speaker Nabih Berri. Later that day, Mr. Kanna also visited Cardinal Nasrallah Pierre Sfeir, Patriarch of the Maronite Church . In the evening, Mr. Kanna met with several heads of the Lebanese political parties and diplomats in Beirut . (ZNDA: Cyprus ) If the people of this remote village were to travel back to Jesus' time and hear him preach, they wouldn't need an interpreter to understand the Sermon on the Mount or the parable of the prodigal son. That's because they speak the same language as the Son of God. Literally. Spoken in the Middle East during Jesus' time, Aramaic is still used in everyday life by most of the 130 elderly Maronite Catholics in Kormakiti, which overlooks the Mediterranean Sea . This could be good news for Mel Gibson. If the megastar has trouble finding an audience for "Passion," his upcoming movie about the final hours of Jesus' life on Earth with dialogue mostly in Aramaic, due to be released next month, the folks here should have no trouble with the original biblical tongue. Still, Kormakiti's unique diluted version of Aramaic, called Cypriot Maronite Arabic, is in danger of extinction. Once the thriving center of the island's Maronite community, Kormakiti now has the eerie atmosphere of a ghost town. Many of the village's stone and mud-brick houses are derelict, their wooden-beam roofs sagging and broken, letting in sunlight. There is bird song but no sound of children, because there are none left in the village. "Sometimes we're like astronauts in the sky - no one's here," says villager Elias Kassapis. The elementary school, run by Mr. Kassapis until 1991, closed down a few years ago when the last pupil left to attend a secondary school across the island's dividing "green line" in the Greek Cypriot region. Under Cyprus 's 1960 Constitution, following independence from Britain , the island's Maronite, Armenian, and Latin religious minorities had to choose to belong to either the Greek Cypriot majority or the smaller Turkish Cypriot community. They chose the former. After Turkey 's invasion of northern Cyprus in 1974, the island's four Maronite villages found themselves on the wrong side of the cease-fire line. The majority of the 6,000-strong Maronite community was displaced, moving south. A stalwart few stayed behind in Kormakiti and three nearby villages in Turkish-occupied northern Cyprus , and are viewed by those who left as heroes protecting Maronite land. The Rev. Antony Terzi, the village priest, negotiated with the invading Turkish Army on behalf of those who refused to be uprooted. And he said the village was safeguarded by the Pope's personal protection. The community nevertheless suffered. Families were forced out because of lack of opportunities, especially schooling. Those who left to study in the south were allowed to visit Kormakiti but not permanently return. Nor are villagers allowed to bequeath property to outside heirs. Providing a lifeline to those enclaved in Kormakiti are Maronite Catholics in the south of the island who send food, medicine, fuel, and other humanitarian supplies, which are delivered every two weeks by UN peacekeepers. On weekends, Kormakiti is transformed when hundreds of uprooted worshipers cross back north to celebrate mass. The main parts of the liturgy are read in Aramaic, Kassapis says. Kormakiti's long isolation from the main currents of the Arab world helped to keep alive its exotic strain of Aramaic, which incorporates Greek, Turkish, French, and Italian words. Hopes for Kormakiti's renaissance were stirred last April when the Turkish Cypriot authorities unexpectedly allowed limited access across the "green line" for the first time in nearly three decades. Now Maronites can visit for longer periods but are still not allowed to reside there. Sensing more of a future for their ancestral village, some are renovating their old homes for weekend use. Their hopes are pinned on a comprehensive settlement plan for Cyprus , which was submitted last year by Kofi Annan, the UN Secretary-General, but which has been rejected by the Turkish Cypriot leader, Rauf Denktash. Under the plan's terms, the Maronite villages in Turkish-held northern Cyprus would come under Greek Cypriot administration. According to some in the Maronite community, the provision was included after intervention by the Vatican . Without a solution to the long-running Cyprus problem, the Maronite community - and its ancient language - in northern Cyprus could vanish, members say. Regardless of your stand towards what you receive from your readers, I don't see any fairness in grouping the official letter you received from the Assyrian Church of The East signed by her clergy with other letters under one misleading title Reflections on Rev Joseph's Article: “Go Home Mar Dinkha”. The letter is not adressing personal opinion but rather an official response to an article you posted and to you as a respected magazine. I fully agree with what was addressed in the letter regarding Rev. Joseph. Insisting on posting such ridicule in your magazine knowing the stand of this person from earlier posts and articles is promoting personal attacks and is conflicting with your policy of banning such attacks. Let us have one stand and one principle. I'm proud member of the Assyrian Church of the East and much angry because the comments these five priests gave that study in Vatican . What's wrong with educated people? Rev. Kenneth Joseph is asking His Holiness to return to Baghdad because he feels Mar Dinkha represents the most important authority in the Assyrian peoples. What is wrong with a protestant Assyrian asking our patriarka to go back to our homeland? Are they not Assyrian too? Am I the only member of our holy church that thinks our patriarka should be in Atra and not in Chicago ? Like those priests I read Zinda too. Now, what's wrong with somebody criticizing our church and giving good or bad solutions. If we were not in this sad situation, why would them five priests be studying in the Vatican ? Someone has to say something. I'm glad it's Zinda and not somebody foreigner. Jesus and his teaching are safe and secure in the hands of our Iraqi Christians borthers and sisters. Our church again can make bishops, archbishops and priests like the ones studying in Rome . We can write good Christian books for all of Christianity too. But this can start when our holy leader returns to our homeland, and we will follow. Right now it seems every body is giving each other excuses not to go back to Iraq and wait for some body to put the red carpet for us first. I have read with great interest Rev. Ken Joseph Jr. article in Zinda Magazine under the title of “Mar Dinkha, Go Home!". It is rather disturbing that an Assyrian clergy " I have no idea of what church" has brought this topic to the public. His Holiness, Mar Dinkha IV, Catholicos Partriarch of the Assyrian Church of The East, would have whole heartidely welcomed his comments if they would have been addressed to the Patriarcate and expected an official response from his Holiness. Apparently Rev. Joseph, who is not a member of the Church of the East, has all of a sudden awakened to his Assyrian nationalistic duties by hiding under his fake recognition of his Holiness as the leader of the Assyrian People, merely to ignite a division among Assyrians at large. Rev. Joseph, who was an anti liberation of Iraq , became a hero of the Assyrian cause, just becuase he made a visit to Iraq . His Holiness, Mar Dinkha IV does not need your advise to tell him what to do. If you bake bread, it does not make you a baker. Therefore, by visiting Baghdad , does not allow you to point fingers at others and publicly criticize them without addressing the matter to them face to face. You claim yourself to be a man of God, but your comments were full of anger and falsehood. By talking to a number Assryian brothers and sisters in Iraq , who have expressed their personal opinions regarding His Holiness does not make you a spokesman for them. His Holiness has an appointed representative in Iraq , His Beattitude Mar Gewargis Sliwa. He is in constant contact with his Holiness. Many Assyrian delegations have visited Iraq and have reported to His Holiness of their mission. No one has told him that he must go home. Rev. Joseph the messenger is ordering His holiness to "GO HOME". Where were his nationalistic feelings when His Holiness visited our Assyrians all over the world, and stood firm on issues of nationalism? If he were a man of God, God Bless him. But no one has appointed him to be a spokesman for the Assyrian Church of the East in Iraq . His Holiness has sacrificed dearly of his personal well being and safety merely by adding the Assyrian name to our church. His missionary work is not for Mar Dinkha. It is to glorify the name of our Lord Jesus Christ. Remember that. The Assyrian Girls' Basketball team wins Iraq 's Championship. The Akkad Assyrian Girls' basketball team of the Ankawa won Iraqi girls' basketball championship. Akkad defeated every team they played during the championship, including the strong Armenian team. Jwad Saleem, the Father of modern fine Arts in Iraq : In his memory a gathering of top Artists and art historians took place in Baghdad in Jan 2004. In it the top present day Iraqi artist, M. Ghani Hikmat said this of the late Jwad Selim who is known by the giant Sculpture wall in center of Baghdad known as Sahat al-Tahrir." Jwad said to me after the monument was erected in its present place: “This is the first Iraqi monument by Iraqis since the last Assyrian monument was erected," - words that need to be put next to the monument in center of Baghdad . Congratulations to the new Administration and Board of Directors of the Assyrian American Association of Southern California for the years 2004 - 2006, elected on Sunday, February 1st, 2004 . These elected individuals will be sworn in at the Installation Party on Saturday, February 21st, 2004 at 8:30 pm at the Assyrian American Assocation of Southern California. Please see our website for more information, including ticket costs. 2004 Membership to the Assyrian American Association of Southern California is now open and membership forms are available at our website at http://www.aaasc.com. I am writting on behalf of my father, Mati Toma and myself. I want to correct your article about Gonda Kosa. Toward the end of the article it talks about the missing chief. The missing chief is Toma Bakos Toma. I know this because he's my father's brother. Along with my uncle many of our relatives died including his wife, Eshoo(Elizabeth) Mooshea Odeisho; his parents, Bakos Toma Bakos and Margo Dinkha, and his 6 children: 3 boys, Sargon, Ashur, Sinkhero and 3 girls: Shmonee, Shooshan, and Mariam. My family is looking forward to … more articles about Gonda Kosa. In Vol. VII, No. 1-2, 1980 issue of Bet-Nahrain monthly magazine (the official organ of the Bet-Nahrain Democratic Party), an article is published under the title: "Another Bet Nahrain Reality." The reality in question was a reference to the establishment of "The Assyrian Christian College" in Ceres, California , which was planned to begin operation in September 1980. The ACC was an idea that started in 1961. The members of the Board of Trustees were elected by the Executive Council of Bet Nahrain to serve as follows: Mr. William Dadesho, Chairman; Mr. Shomshon Warda, Vice-Chairman; Reverend Monsignor Badal Piro, Member; Mr. Davis David, Member; Mrs. Elenor Khamo, Member. Dr. Sargon O. Dadesho was appointed as the first President of the ACC and professor of Biological Sciences and Assyrian; Dr. Benedict Beit-Ishoo as Dean of the College and professor Romance Languages, Literatures and Philosophy; Dr. Vladimir Tuman as Honorary Acting Dean of the Faculty. These three individuals were to administer the college. The announcement was published in the August 20, 1980 Ceres Courier Newspaper under the title of "Junior College Established in Ceres." The vol. VII, No. 6-7, 1980 issue of Bet-Nahrain magazine indicated that the ACC was to have departments of business and economics, English, art and music, biological science, foreign languages, history and political science, mathematics and computer science, philosophy, physical education, physics and physical science, religion, and most importantly Assyrian studies. The vol. VII, No. 8-9, 1980 issue of Bet-Nahrain listed the names of Assyrians who donated money for the establishment of the ACC. Page 14 included as well the amount of money raised in a special dinner-dance party to raise money for that purpose. The total amount raised, as indicated in this issue of Bet Nahrain magazine, was $25,697,49 in that party alone. Does anybody have any information on the reasons for not having the ACC? Furthermore, what happened to the money that was raised? Was the money raised returned to the donors since the project did not see the light? A guide to children, parents and student of Syriac, with 22 illustrations. Each pair of facing pages introduces a single letter of the alphabet with a word that begins with the letter in question on one side, and an illustration of that word on the other side. The letters are hallow and can be filled and colored by children. Notes on each page give the name of the letter on that page, how the letter sounds, a phonological transcription of the sample word, and the meaning of the word. In 2002, Beth Mardutho: The Syriac Institute launched The Syriac Digital Library Project—codenamed eBethArké—with the objective of creating the largest digital collection of Syriac manuscripts, books, journal articles, pictures and maps, and making all this material available on the Internet. During the past two centuries, the Syriac manuscript heritage was moved from the Middle East to Western libraries and museums; hundreds of books were published from these treasures. Now, for the first time, Beth Mardutho will bring together all this material from East and West, preserving Syriac manuscripts and printed books, and making them accessible worldwide. Students, clergy and seminarians, scholars, and the general public will be able to access the entire collection anytime from anywhere in the world. Our goal is to have 2,000-3,000 holdings in our library within three years. Your support is crucial to meet this objective. In January 2004, The Catholic University of America (CUA) gave Beth Mardutho full access to digitize its Syriac collection, from March 1 until July 31. This small window of time—due to construction work at the library—should not be missed. CUA's collection is indeed unique and one of its kind in North America . Beth Mardutho plans to secure scanning equipment and hire two students on full-time basis to have as many books as possible digitized for inclusion in The Syriac Digital Library. The budget for this task is around $35,000. We have already raised $10,000. Working together, we can raise the remaining $25,000 to funds this important project. During 2002 and 2003 we succeeded in building a coalition of library partners who agreed, like CUA, to give us access to their collections. This coalition includes the libraries of Brigham Young University , Brown University , Duke University , Harvard's Dambarton Oaks, the Peshitta Institute of Leiden University, and Princeton Theological Seminary. Our partners have already contributed over 30,000 digitized images. During 2003, Beth Mardutho built a prototype interface for the eLibrary on the Internet. To give everyone the opportunity to take part, we have devised various donation plans. All donations are tax-deductible (in the U.S. at least), and can be made online or by sending a check (see detailed information on the next page). Adopt a book or more. You can adopt one or more books at a donation of $250/book. Your name will be acknowledged in Mardu and permanently on our web site as a book adoptee. Silver Collection. Contains 50 books for a donation of $2,000. Your name and/or the name of the person you choose will appear on the collection in the library, with a brief biography. Gold Collection. Contains 200 books for $5,000. Your name or the name of the person you choose will appear on the collection, with a detailed biography, and picture. Benefits also include life subscription to our journal Hugoye: Journal of Syriac Studies (printed edition). Larger collections are also possible. Please contact Dr. George Kiraz for arrangements via email at gak@bethmardutho.org . Institutional Support. The Syriac Digital Library project has a Partnership program that allows institutions to have full access to the library we are building. Institutions that wish to join may contact Dr. George Kiraz at gak@bethmardutho.org. We also welcome donations of any amounts from those who cannot contribute at the above levels. Simply, donate any amount of your choice towards the project. Your name will appear in the donors list in our newsletter Mardu. Via Fax. You may fax the credit card information (number and expiration date) to +1 732-699-0342. Please include your name, address, and the amount you wish to donate. 46 Orris Ave. , Piscataway , NJ 08854 . USA . Gabriel Aydin was born in 1975 in the village of Gundukshukro near Nisibin in the region of Tur Abdin – southeast of Turkey . He studied Syriac language and literature as well as Syriac theology and liturgical music at Mor Gabriel Seminary. In 1994, he entered Istanbul Conservatoire and studied there for two years. Following this, he moved to Lebanon for further studies in music where he entered the University of Holy Spirit in Kaslik (USEK) to learn scientifically the history, nature and development of Syriac Music. He earned a Bachelor of Music from USEK in 2003 and the same year produced his first Syriac CD entitled “Nusrotho”. Shlimon Bet-Shmuel has released an official website, offering his music to be experienced in more ways than one. Downloads, streaming audio, and video footage of Assyrian homeland, a strong influence in Shlimon's songs, is included on the website. To accompany the music and video, some lyrics have been posted for the listener's convenience. More information about Shlimon regarding his life and inspirations are provided by his unabridged biography, and articles and transcripts featuring the purpose behind his songs and the structure of his music are also included. In May 2004 the Assyrian village of Urmia, near the city of Krasnodar in the Northern Caucasus of Russia (approx. 1000 kilometers from Moscow ) will celebrate the 80 th anniversary of its establishment. This village was founded in 1924 by a group of Assyrian refugees who fled the Turkish genocide of our people between 1915 and 1918. Before their escape, they lived in the Armenian village of Arasdayan , near the Turkish border. They arrived in Armenia from the the Urmain (in Iran ) village of Atlakandy . The village has grown into a large settlement as other non-Urmian refugees from Turkey and Iran continued to arrive. In addition to Urmijnai founders, other Assyrian settlers include Albaknai, Gavarnai, Shaputnai, Diznai, Jilwai, Nudisnai, Livinai, Talnai, and others. Currently, there are up to 800 people, mainly Assyrian living in the village of Urmia in Russia . The inhabitants of the village are engaged in agriculture, growing vegetables, and breeding cattle. Being the only Assyrian settlement in Russia , the village of Urmia serves as a cultural center for all Assyrians communities of Russia . The celebration between May 1 and 5, therefore, will consist of music and dance contests, and soccer tournament. We, the Assyrians of Urmia and the Kuban region, cordially invite every Assyrian from around the world to take this once-in-a-lifetime opportunity to visit Russia and meet the historic Assyrian communities and settlements in our beautiful country. On your visit to Russia , you will have the opportunity to see the city of Krasnodar and Rostov-na-Donu were thousands of Assyrian families call home. Registration includes transportation from Krasnodar airport to Krasnodar ; from Krasnodar to Armavir, and everyday transportation from Armavir to Urmia and back, and meals (lunch and dinner) in Urmia. In order to reach the village of Urmia , plan on flying to Moscow first, then to Krasnodar . Airfare for the round trip from Moscow to Krasnodar is about 150$. -A Fax number to which you can receive an invitation. Please, indicate also your E-mail address for returned communication. 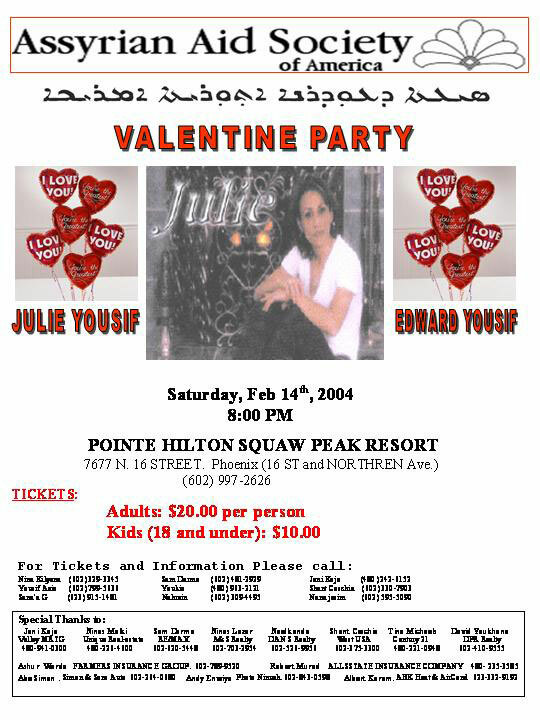 Please send your request for invitation no later than March 15, 2004 . We look forward to see you in Urmia , Russia . Saddam Hussein's Ba'ath party regime exercised a policy of Arabisation, whereby Arabs were moved in to regions formally dominated by ethnic minorities, in order to change the demographics. The Kurdish claim is for an ethnic federation and a reversal of Arabisation. One thing that is not being talked about is the effect such a situation would have on the other inhabitants and ethnic minorities of northern Iraq , such as the Assyrians, who are the indigenous inhabitants of northern Iraq and are Christian. Peter BetBasoo has produced an excellent summary history of Assyria and the Assyrian people on the website of the Assyrian International News Agency (AINA). He describes Assyrians as “a Semitic people indigenous to Mesopotamia ”. With a map he shows the historic Assyria as located in north Mesopotamia , spanning four countries – from the Euphrates River in north-eastern Syria , through the eastern corner of Turkey , western edge of Iran , and northern Iraq to about 100 miles south of Kirkuk . The plains of Arbil and Nineveh ( Mosul ) were the breadbaskets of the Assyrian people. Only a decade after the genocide of the Armenians (1915-23), the Assyrians suffered a major massacre in Iraq during the post-WW1 mandate period (1933). Actually the history of the Assyrian people, particularly since the arrival of Islam in the region, has been one of frequent massacres and almost continual oppression and persecution. The Assyrian International News Agency (AINA) reports that the present Kurdish proposal “to establish an ethnically based autonomous area even beyond the current occupied northern provinces has alarmed various Iraqi communities including Assyrians (also known as Chaldeans and Syriacs), Arabs, Turkman, and Yezidis within Iraq and abroad. The Patriotic Union of Kurdistan's (PUK) Barham Salih recently declared that the Kurdish autonomous area ought to be extended beyond the three occupied and already diversely populated and contentious provinces of Dohuk (Nohadra), Arbil, and Sulaimaniya to include large portions of Diyala, Nineveh, and Karkuk. Ashor Giwargis, born in Beirut in 1970, is a researcher and writer concerning the Assyrian cause. He writes out of great concern for the future of Iraq 's Assyrian Christians. “Before the coming of the Ba'ath regime to Iraq in 1968, Assyrians constituted 65% of the population of the northern region, and the Kurds were about 15% and Arabs about 20%. During the 1st Gulf War, Kurdish tribes came in from Iran , supported by the Iranians to fight against Iraq . They destroyed our villages. As a result, the majority of the Assyrians fled their towns and migrated to Syria , Lebanon and Jordan , seeking refugee visas to U.S.A, Europe , and Australia . That's why today we have some 3.2 million Assyrians in the Diaspora. The Assyrians make up 30% of Iraqi immigrants. Q: What is the present state of the search for Christian unity? Bishop Farrell: There are lights and shadows. Significant ecumenical achievements are visible at the local level of parishes, dioceses, associations. All kinds of shared activities and cooperation are being implemented. Generally, people are convinced that there is no turning back from the search for the unity that Christ wishes for his followers. There is a new interest in "spiritual" ecumenism, that is, in prayer for unity and in purifying the idea that communities have of one another. Among the shadows: Some become discouraged that things take so long; it is not always easy to involve the younger generation, which has perhaps less experience of how relations between divided Christians have changed in past decades. And then, importantly, after the various ecumenical dialogues have focused on the many things Christians have in common, we are now reaching the point when we have to face the deeper differences between the Churches, and this requires more patient and more penetrating effort. Impatience is a great temptation against ecumenism. Q: How are relations between the Catholic Church and the Orthodox Churches ? Bishop Farrell: Enormous progress has been made in recent years in improving relations and cooperation with the various Orthodox Churches individually. With practically all of them there is regular contact and exchange of ideas. There are frequent visits of delegations -- impossible to list them all here. There is an increasing effort to face common challenges together, especially in Europe . Unfortunately, all of this is sometimes overshadowed by the media insistence on the tensions and misunderstandings which can and do exist in some cases. In the new situation in Eastern Europe since the fall of Communism, the Catholic presence is more visible, and this is sometimes perceived as a threat by the Orthodox. They have a wider concept of proselytism than we do in the West, and therefore tensions do arise. This is especially true in many of the events surrounding the re-emergence of the Greek-Catholic Church in Ukraine . Only in a fraternal love that excludes rivalry and competition, and is truly an exchange of gifts, can we overcome these serious difficulties. Another important sign that we are making headway is the great effort which has been made on both sides to restart the international theological dialogue between the Catholic Church and all the Orthodox Churches together, stalled for the past few years. The coordinating committee of the dialogue will be convened in the near future to suggest a path forward. Q: How are relations with the ancient Churches of the East? Bishop Farrell: These are the Churches which remained outside the influence of the Roman Empire and developed their own specific traditions in theological and ecclesiastical matters: the Copts, the Syrian Orthodox, the Armenian Apostolic Church , the Orthodox Church of Ethiopia, the Malankara Church . With these the Pontifical Council for Promoting Christian Unity has begun a new theological dialogue. There is also a dialogue in course with the Assyrian Church of the East. These Churches are especially present in the Middle East . In the present situation of conflicts and divisions, the leaders of the Eastern Orthodox Churches are conscious of the need to strengthen their cooperation on the pastoral and social levels. Ecumenically they tend increasingly to work together as a family of Churches. After a preparatory meeting with representatives of these Churches here in Rome last year, the first session of the dialogue will take place this coming week in Cairo . The Holy See will be presented by Cardinal Kasper, and it is hoped that the meeting can, above all, strengthen already existing forms of cooperation and communion. Q: What is the motor that fuels ecumenical work and progress? Bishop Farrell: As you can see, the ecumenical world is a vast and varied one. The overall picture is of achievement and progress. We know that unity will be God's gift and not a human feat. It is important to return to the core concept of the ecumenical movement, the impulse that has sustained and inspired it from the beginning, and to develop on that basis a new energy for and a new commitment to true dialogue. Crucial at the beginning of the ecumenical movement was the spiritual ecumenism that inspired the Week of Prayer for Christian Unity and sustains it still. The ecumenism of life and love must be renewed at all levels, from theology to pastoral activity. If ecumenical cooperation could create ever increasing numbers of "meeting places of unity in diversity," this would open up a field of intensive learning and action; it would offer the experience of a reconciling and enriching communion in action as a way of deepening the bonds between Christians on the basis of their common baptism and faith in the one Lord Jesus Christ. There are people who take great pains to twist the sense of the divine scriptures," wrote the fourth-century biblical scholar, Theodore of Mopsuestia, a prominent voice of the exegetical school centered at Antioch, "and make everything written therein serve their own ends. They dream up silly fables in their own heads and give their folly the name of allegory. They misuse the apostle's term as a blank authorization to abolish all meanings of divine scripture." At the beginning of the third century, Origen of Alexandria introduced to the church an exegetical method that searched for the hidden, spiritual meanings of Old Testament passages, treating the Old Testament as a great allegory of Christ. Most biblical interpreters who followed him worked in this tradition. But not all. A few Christians recognized the danger posed by the allegorical method. Someone must hold the "spiritualizing" interpreter accountable, or Scripture meanings might be warped into forms the biblical authors never intended. As Paul once said of Tarsus , Antioch was "no mean city." We know it as the place where Jesus' followers were first called "Christians," but its secular fame was also well-established. Founded three hundred years before Christ, this city on the Orontes River in modern-day Turkey became the Roman empire 's third largest city. Antioch stood at an east-west crossroads and exerted enormous cultural and political influence throughout the empire. "In what land or sea had the fame of this city not entered?" asked Libanius, chief rhetorician of the Hellenistic school in Antioch . "Attractions of all kinds bring people from all sides [of the empire], from Africa , Europe , Asia , from the islands, from the mainland." Libanius's school of rhetoric dominated the intellectual environment of Antioch . In Greco-Roman culture, young men wanting higher education trained in schools of rhetoric and philosophy. When rhetoricians read classical literature, they looked for moral principles and ethical models civic authorities could follow, while philosophers, particularly the Stoics, searched for symbolic meanings. Libanius swayed Antiochians (Christians included) toward the rhetorical perspective and away from the metaphysical, even mystical bent of men like Origen. Lucian of Antioch (d. 312) was the first to offer an alternative to Origen's approach. Emphasizing the need for textual accuracy, he set about revising the Septuagint. Jerome, translating the Hebrew Bible into Latin years later, praised Lucian's work. Eustathius (c. 270-360), bishop of Antioch , directly criticized Origen in his treatise On the Witch of Endor. For example, Origen had apparently claimed that in 1 Samuel 28, the witch's calling up of Samuel from Hades foreshadowed Christ's resurrection. Eustathius countered that only God can raise people from the dead, and that the devil used the witch to deceive Saul into thinking Samuel spoke to him. Whether Eustathius was correct is not the point; his concern for the integrity of the text led him to directly confront Origen's premise for finding Christ there. It was Diodore of Tarsus (d. 390), though, who founded the "school" of Antioch that fully challenged Origen's method. "We demand them [the Alexandrian exegetes] to know that we prefer much more the historical comprehension of the text than the allegorical," he wrote. Diodore believed Origen's method disparaged Scripture, and he encouraged Christians to retain its literal meaning. Doing so did not rule out theoria, or higher "contemplation" of the biblical passage. But it must be consistent with the author's intentions and the text that surrounded it. While Origen felt spiritual truth lay beyond the words, like a code to be cracked, Diodore felt meaning lay within the words, pregnant with spiritual significance but still rooted in history. Diodore's most famous student, Theodore of Mopsuestia (ca. 350-428) carried Diodore's ideas even further. He questioned the canonicity of some of the books in the Bible—especially the apocryphal books in the Septuagint—and preferred the more limited "Jewish" canon. He refused to place the "wisdom" literature on the same level of inspiration as the rest of Scripture. The Song of Songs, he said, was simply a conversation between lovers and nothing more. And he aggressively criticized Paul's epistolary writing style, thereby departing from the traditional understanding of biblical inspiration. Like Diodore, Theodore was determined to set the biblical text in its historical context. In his commentaries on the psalms and minor prophets—the only works still extant—Theodore wrote an introduction in which he discussed the date, authorship, historical occasion, the purpose of the writer, and a summary of the plan and perspective of the book. In this, his work resembles modern scholarship to a remarkable degree. But Theodore had some radical ideas. Fidelity to the text, he argued, demanded that scholars drastically reduce the number of Old Testament passages that Christians had traditionally held to be messianic prophecies of Christ. In virtually every case, the prophecies of the minor prophets and psalmists referred not to Christ, but to the events of the post-exilic period. In fact, he limited messianic psalms to just four—Psalms 2, 8, 45, and 110. Even Psalm 22, the psalm Jesus quoted on the cross, was not prophetic of Christ. "Those commentators who claim that this psalm is related to the person of Christ ought to know that they can be accused of recklessness because the second half of the opening saying of the psalm does not allow such an interpretation. How could Christ ever speak of his sins?" By so limiting Christ's presence in the Old Testament, Theodore ran the risk of divorcing it entirely from the New—in a sense creating two Bibles. Theodore also emphasized to perhaps an unfortunate degree the humanity of Christ in his writings. One of his students, Nestorius, held that Christ had "two natures which are adored in the one person of the only-begotten by a perfect and unconfused conjunction." But Nestorius was later condemned by the Council of Ephesus (431) for dividing Christ's person into two, and Emperor Theodosius II branded him as a heretic. In 553, more than 100 years after Theodore's death, the Council of Constantinople condemned Theodore's views as heretical and ordered that his commentaries be burned. Only the Nestorian church remembered and preserved his writings. Ironically, orthodox Christians are once again rediscovering the scholar who most effectively challenged the school of Alexandria —and provided another way of understanding the Bible. On Friday January 30, 2004 , Assembly Member Greg Aghazarian (R-Stockton) presented Mr. Albert Gabriel of Nineveh.com; author and commentator, Mr. Fred Aprim, and editor of this publication, Mr. Wilfred Bet Alkhas, with framed copies of resolution AJR 31 recognizing their efforts in writing, promoting, and publicizing the resolution. It was on April 23, 2003 , that California legislators introduced the resolution to recognize the Assyrians in future Iraq . On June 24, 2003 , the California Joint Assembly filed Resolution AJR 31 (The Assyrians in Iraq ) with the Secretary of State as the Resolution passed both houses of the State of California with an overwhelming approval. The idea of the Assyrian resolution was originally initiated in spring 2003 by Mr. Albert Gabriel. He suggested to Fred Aprim that it would be beneficial if Assyrians passed a resolution in California to honor and recognize the Assyrian Levy for their services for Great Britain and the Allies from 1920-1955, especially during WWII. Mr. Aprim quickly drafted the initial proposal. Assemblyman Aghazarian and his staff added further information about the ancient Assyrians and their contribution to mankind, send it back to Albert and Fred, who put the final touches on this draft. Other minor modifications were made on the draft while on the House floor, and finally it passed overwhelmingly as the State of California Assembly Joint Resolution No. 31 (AJR 31). Zinda Magazine's founder and editor, Mr. Wilfred Bet-Alkhas, played a great role in gathering support for the resolution through a special web page that was designed for that specific purpose. The website accounted for hundreds of international and out-of-state letters to Assembly Aghazarian in addition to more than 500 in-state responses. We want to thank all fellow Assyrians who took the time and sent their support to the office of Assembly Member Greg Aghazarian (the final figure of supporters stood at 866 individual Assyrians worldwide). If this resolution proved something, it is then that we as individuals can make a difference.